Manta rays can be seen in Bali all year round and they definitely are one of the main attractions. No surprise there. Mantas are beyond magical and meeting them face to face will leave you breathless. Moreover you don’t have to be a diver to enjoy their presence. Snorkeling is also a great way of observing them. However it is not an activity recommended for weak swimmers or small children, as the surface can get rather wavy at times. If you are a passionate scuba diver, it is quite possible that spotting a Mola Mola - Sunfish is already on your diving wish-list. These peculiar giants (3-4m large) usually live too deep (below50m) for the divers to encounter them. Luckily, there is a Mola season in Bali! Every year between August and October they swim up to shallower depths where they let the small fish to clean them. While being cleaned, Molas fall into a kind of idle state where they just relax and enjoy the treat. This is actually the best chance for the divers to take a closer look. Note that an advanced open water diver certification is recommended for Mola Mola dives. Bali dive sites are full of all sorts of tiny critters of all shapes and colors. 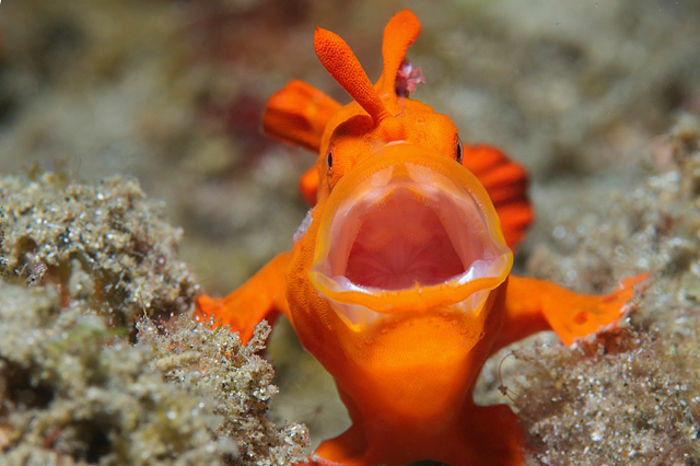 Underwater photographers come from all over the world in hope of getting the best shot of the tiniest of critters. There are several great macro dive locations around a small harbor town of Padangbai, located on the central East coast of Bali. The 120m long and for more than 50 years sunken wreck of the USAT Liberty Ship is regularly featured in various “best dive sites of the world” lists. The cargo ship was torpedoed by a Japanese submarine during the World War II and then beached in Tulamben, until the eruption of Agung volcano pushed the wreck into the sea where it lies today. It is an amazing diving and snorkeling location suitable for all levels of experience and offering a nice variety of macro and marine species to observe. The greatness and stillness of the wreck will amaze you and is definitely worth experiencing. You don’t have to be a super experienced diver to be able to join a night diving trip. However mastering your buoyancy and not being afraid of the dark are two important prerequisites, even though you will have a dive torch and be able to see where you’re heading. Many amazing critters come out at night, octopuses, cuttlefish, crabs to mention a few. Night dives are great to observe the endless variety of macro life, but stingrays and small sharks might also pop by. Diving in Padangbai and Tulamben offers wonderful night dive experiences. What is your favorite diving spot in Bali? Let us know in the comments below.